London Design Festival 2010: designer Asif Khan created this shop interior using dust sheets, nylon rope and white paint. 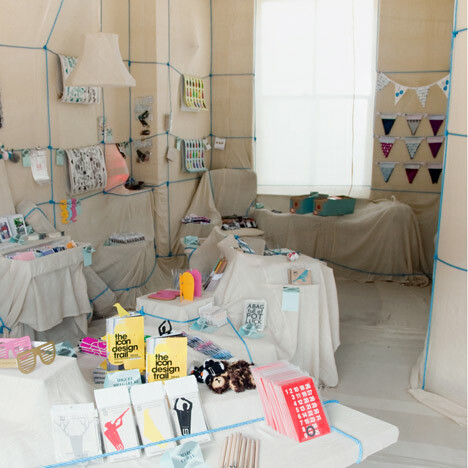 The temporary east London store, called Poundshop, was open for the duration of the London Design Festival and initiated by design collective Household with illustrator Sara Melin. Furniture from the organisers' own homes was wrapped up and used to display items for sale. On a budget of £250 we have just completed a pop-up Poundshop for Household+Sara Melin which is open for London Design Week. The location is within a former hair dressers on Roman Rd, a typical high street in the heart of London’s East End. Taking an image of Christo’s Four Store Fronts Corner in 1964 as a point of departure, we used a combination of cotton dust-sheets, nylon rope and white-out paint as a palette, materials which are common scenery on this street of rapidly-changing businesses. We invited Household+Sarah Melin to contribute furniture from their homes, which we piled within the space and then wrapped to create an eclectic landscape for showcasing the Poundshop products. After a spectacular launch in April 2010, The Poundshop returns for London Design Week this September! Design collective Household and Sara Melin have joined forces to create the ultimate low cost, high quality shopping experience. With a shop interior created with Asif Khan we would like to introduce products from new poundshoppers and past friends. Browse through products like wooden buttons from Peter Nancini, posters from APFEL, candle holders from William Smith and silkscreened cards from Lisa Jones. Welcome to the wallet friendly Poundshop, a boutique selling excellent products only for a pound!